One thing that I’m learning from genealogy is that everyone lies. Some are interesting, some are whoppers and some are just silly. Case in point. One of my grandmothers lied about her age. Not an uncommon occurrence. She lied about her age so that no one knew she was older than her husband. What I want to know is if he knew about it. Or if she conned him all of her life. Can you guess? Evidence #1 – US Census records and other records have her birthday at 1889. Evidence #2 – On the Vermont death records, she is clearly listed as having been born in 1894. My grandfather must have been in on it because her younger brother was born in 1891. #3 – On the 1940 Census she was married to my grandfather (step-grandfather, actually, as my biological grandfather was killed in WWI), the only grandfather I knew and loved with all my heart. And……she lied about her age. Did he really know? He must have known. But I have no idea. I just think it’s funny. Her gravestone is wrong, for heaven’s sake. But guess what. 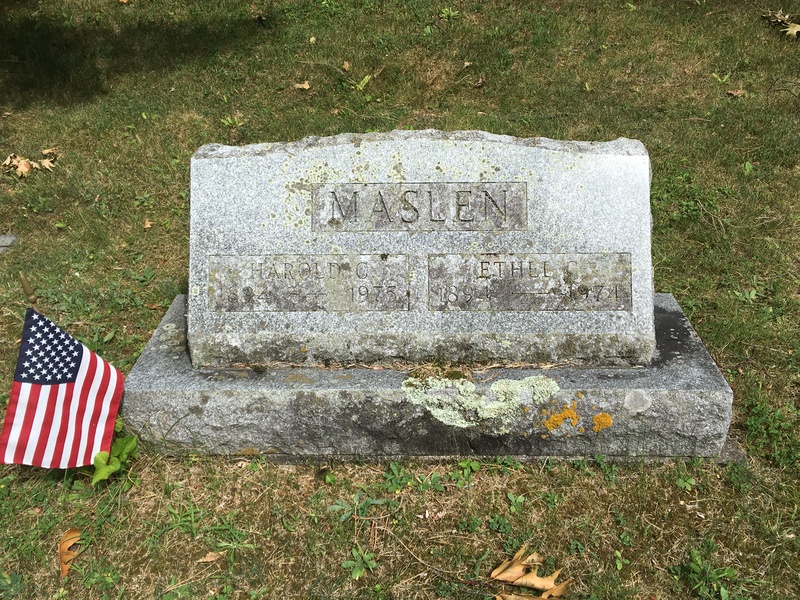 It turns out that his last name wasn’t really Maslen, it was O’Rourke. And we didn’t find that out until recently. Geesh. My maternal grandfather was born in New York City in 1895. All of my life, we have been told that we are Dutch. That he came from the Netherlands. His father was born in Germany in 1866 and emigrated from Germany when he was about 2. I have traced my grandfather’s direct line back to the 1600’s and so far, every single male until they emigrated to the US, has been born in Germany. On the US Census of 1900 and 1910, my great-grandfather’s place of birth is listed as “Germany.” Then, beginning with the US Census of 1920 until my grandfather died, he listed his father as being born in Holland. I’m sorry, but that’s a whopper. I’m guessing that since the US was at war with Germany in WWI and WWII, my grandfather thought it was circumspect to say he was Dutch, since he always lived here and his family was here, not there. I haven’t gotten through all the spouses down the line yet. But most seem to be from Germany. We definitely have some Dutch somewhere, but his father, grandfather, great-grandfather and all the way down that line to at least the 1600’s were definitely German. Man, did I call all my brothers and all my cousins after that discovery. I, too, have my secrets. This entry was posted in Uncategorized and tagged census, families, family lore, family secrets, genealogy, Germany, Humor, lies, lying, secrets. Bookmark the permalink. We all tell fibs or porkies at one stage or another. They can be quite harmless until you’re caught out. As for the age thing, my Mum was older than my Dad by 8 years, my sister older than her late husband by 5 years and my niece is 6 years older than her husband to be. These days it doesn’t seem to matter much, but in your grandparent’s time, it was a different story. I guess so. I am 4 years older than my husband and it’s no big deal. What’s funny to my cousins and me is that we are just discovering all of this doing genealogy. And doing the genealogy is hard enough with the correct facts! Absolutely! Records are hard enough to find. And people misspelled names in Census reports, immigration records if you can find them. I’ve decided all of my relatives from Ireland swam to the US. Finding how they got here has been the hardest! Exactly! We only knew what she said and what her gravestone said. As I’m sure you know, in genealogy, especially from far back, years were often more “about” with a give or take of a year. But she didn’t “change” her year until her remarriage. I’m not sure how they adjusted to her younger brother being “older” than she was lol. You were hoping for neanderthals and found a bunch of liars. What a twist! hahaha! I just laughed so loudly that Tim turned around and he’s at work 45 miles away! I know part of Ancestry (def for US, Canada and UK) have a section for information about adoptions. Yours is going way back, though, and I’m sure you’ve looked there. Have you tried doing your DNA? That could hook you up with relatives. True. And many families in Ireland had births and deaths at home and didn’t always keep records. I think you’re right about the lying thing. We all have our reasons, and they make sense to us, but it sure makes it harder for others to get at the truth. My grandmother was told her name was “Anna Lee” when she was a child. But when she turned 18, she saw her birth certificate for the first time and learned her name was “Anna Agnes.” So she marched right down to City Hall and changed it to “Anna Lee” legally. Or at least that’s the story she always told me…. That’s a great story. The same grandmother who lied about her age (and the grandmother who I try to emulate every day…..I love her and miss her so much) also had a fluid name. She always told me her name was Mae Ethel, but she went by Ethel. Then some records show Mary Ethel. My cousins were told she was Ethel May. I just know I love her so it doesn’t matter. But if she were 5 generations removed I’d be super-confused and it would be difficult to discern records.Were you named for Anna Lee? I’m not sure. My parents were a bit vague about the whole thing. Still, I liked having (almost) the same name as my grandmother, since she went by “Ann” rather than “Anna” and the same birthstone. And I think the fluidity that is in all family stories would make tracing our ancestors much harder! Still, you are finding out the basics, and that’s what counts. Well, you know the old Irish saying “Don’t let the truth get in the way of a good story”? I rather like going with that, although (to my knowledge) there is little to no Irish to be found in my DNA. Doesn’t mean I didn’t relish the tales of my Norse ancestors who of course were all daring warriors or cunning traders (and I squee’d out loud when the Vikings TV show featured Hedeby, a town I only knew from Nana’s “Once upon a time…” stories until then). I’d say the Schnapps is definitely true. Great comment. Thank you for reading this! Well, although I’m a tiny part AmerIndian, and trace Asian, everything else for me, and for many Americans is Europe. I was originally astounded that I am a little less than 10% Western Scandinavian Until I remembered the Vikings who came through France and UK and there you have it. Well….I like to think so! I’m not sure my husband would agree, lol.